Thanksgiving dinner may be one of your favorite holidays, but if your hearing has been getting worse, the holidays aren’t as much fun as they used to be. Thanksgiving is a great time to enjoy an amazing dinner and reconnect with your extended family, but if you’re struggling to hear and have a hard time following conversation, you may be worried about connecting this holiday season. 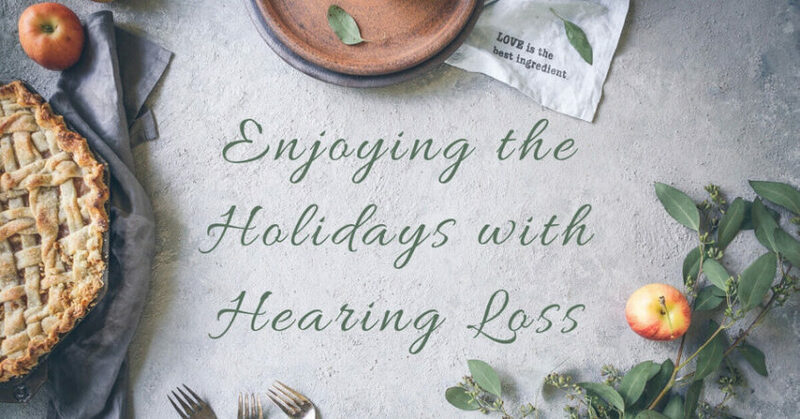 Here are a few pointers for enjoying the holidays with hearing loss. The biggest culprit in creating a difficult listening environment is background noise. Family dinners can get very loud, with kids running around, adults yelling, and the dog barking at the front door. If you have hearing loss, your brain is being overloaded with sounds from every side, and you struggle to figure out which sounds are important speech sounds, and which are background sounds that can safely be ignored. As you’re trying to figure this out, the conversation rushes ahead, and you find yourself completely lost and confused. Background music can set the mood, and the TV in the corner can keep the children entertained. But if some of the guests have hearing loss, all that background noise could make it impossible to follow conversations, or feel included in the festivities. To reduce the background noise, turn off the TV and turn down the music volume. Better yet, save your playlist for after dinner while everyone is relaxing or nursing their food coma with a quick nap on the couch. Consider splitting the group between several rooms by sending the children outside to play, and opening both the living room and the dining room for people to chat. This keeps noise levels down, and people can more easily mingle and enjoy one-on-one conversations where everyone can easily follow what’s being said. All the noise can get overwhelming, and you may feel embarrassed that you can’t hear what’s been said, or have to ask your family to repeat themselves over and over again. While you might want to find a quiet room upstairs to get away from all the noise and hide from your relatives, a better approach to enjoying the day is telling your family what you need. They want to include you in the holiday, and will be happy to help you hear. Don’t Yell: People often think that raising their voices will help you hear. The truth is, when someone yells, you have an even harder time understanding what they’ve said. Sometimes increasing the volume can help you catch a few more sounds, but more often than not, yelling distorts the words, and makes it even harder for you to follow the conversation. Speak Clearly: Rather than raising their voices, ask your family to speak clearly. You’re doing your best hear them, and if they speak clearly, you’ll have an easier time understanding them. Another way to help you follow the conversation is to add short pauses after sentences or phrases, giving you that extra second to make sense of what they’ve said. Don’t Repeat, Rephrase: When you ask someone to repeat themselves, it often doesn’t help you hear. You still can’t understand the words they’ve said, and you feel bad asking them to repeat it a third time. If you can’t understand something that’s been said to you, ask the person to rephrase rather than to repeat what they’ve said. This will give you more context for what they’ve said, and help you understand the meaning behind the words. While these tips can help you enjoy the holidays, the best way to connect with your family is to look after your hearing health. If you’re anxious going into the holiday season and are worried you won’t be able to connect with your family and create wonderful memories together, then call us at Hearing Aid Associates to book a hearing test. Modern hearing technology allows you to hear in background noise, using directionality microphones to focus on what you want to hear, and background sound reduction. Not only that, but the slender design, along with models that sit completely within your ear, will provide the best in discreet hearing, so you can enjoy the holidays without worrying about your hearing.